A large walled Byzantine monastery, founded by Martyrius in the 5th C. The site, one of the largest and most beautiful communal monasteries in the Judean Desert, was recently opened to the public after extensive excavations & restoration. 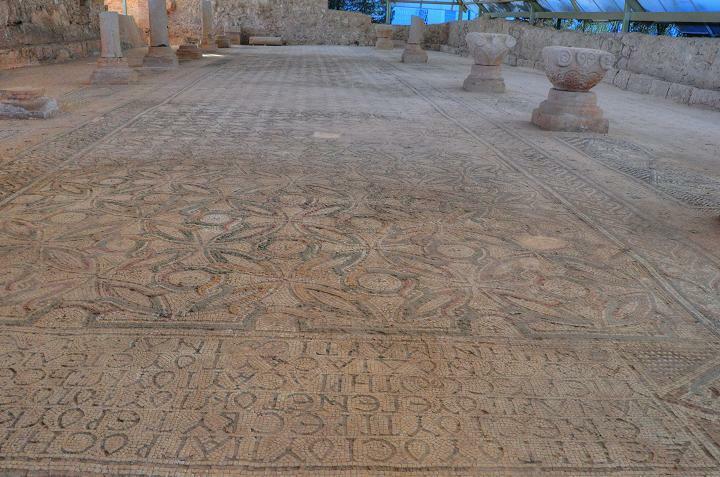 The Monastery was founded in the 5th century AD by Martyrius, near the road from Jerusalem to Jericho. Martyrius secluded here in a cave as a hermit. 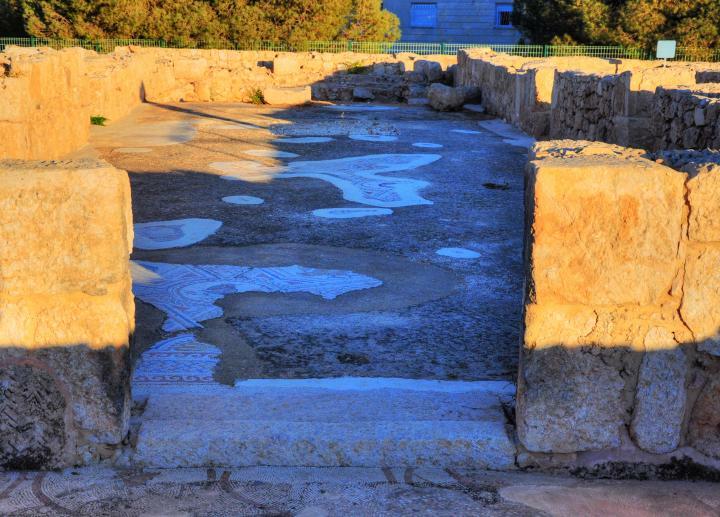 After he became the Patriarch of Jerusalem (478-486), he turned the monastery to become the largest walled monastery in this region, covering an area of 10,000 m2. The site is well preserved and contains a church, chapels, refectory and kitchen, stable, rooms for monks and a hostel for visiting pilgrims. 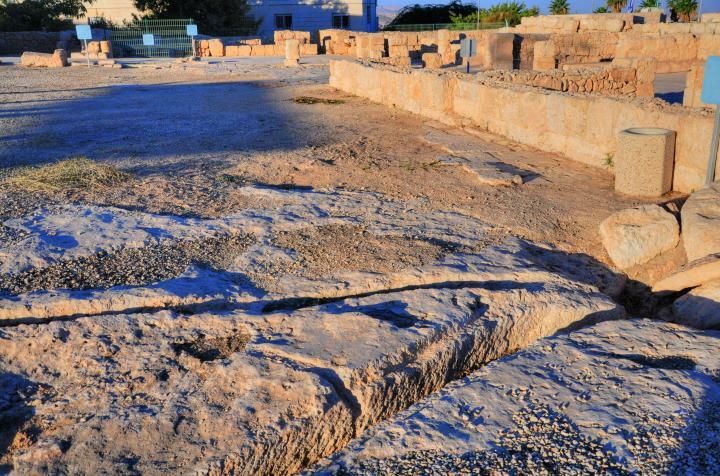 The site is located on a high hill in the middle of the city of Ma'ale-Adummim, east of Jerusalem. 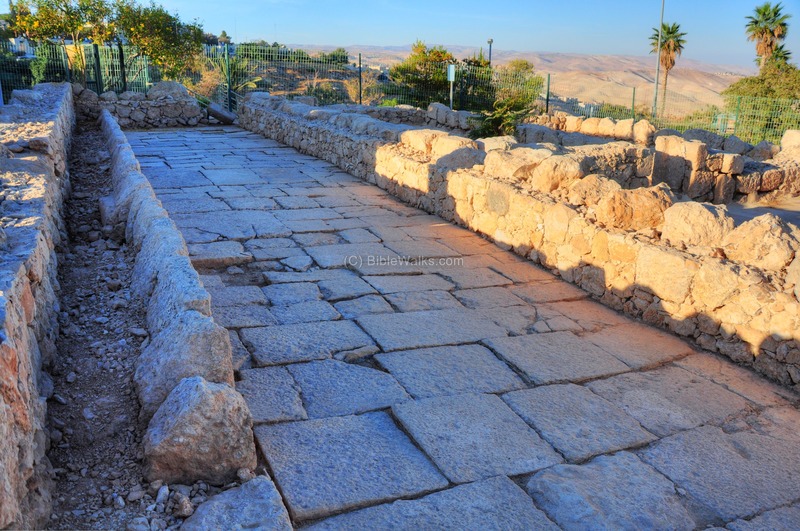 The monastery is located 2km southeast of the ancient road from Jerusalem to Jericho. 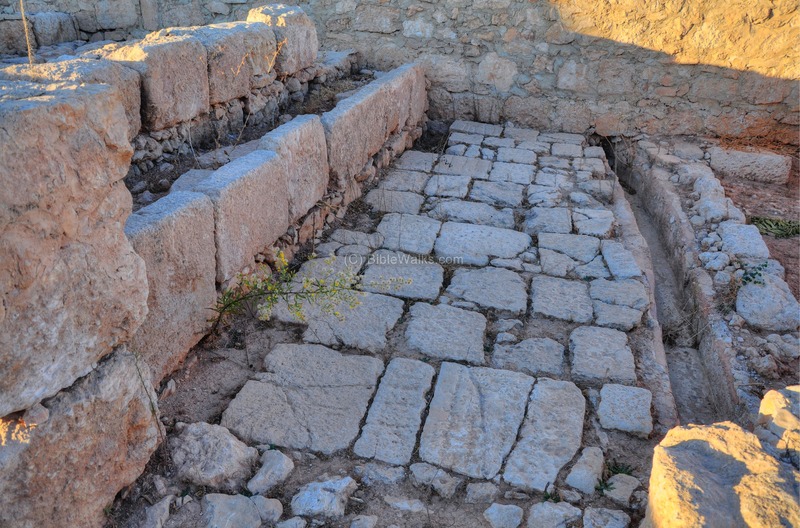 The life of Martyrius was documented by the biographer of Euthymius, Cyril of Scythopolis, who lived in the nearby Euthymius Monastery for 10 years (545-555). His testimony (“Life of Euthymius” or "Kyrillos von Skythopolis") provides a valuable source of information. Martyrius was born in Cappadocia (Eastern Turkey). He spent some years as a hermit in the large monastic center of Nitria, Egypt, which was then the center of monasticism. He arrived in the Judean desert in 457, together with a friend Elias, an ex-Arab monk who also was a prominent hermit (he founded monasteries and became the Patriarch of Jerusalem in 494-518). Both monks were expelled by the Patriarch of Alexandria due to their pro-Chalcedon view - meaning that they sided with the resolutions of the Fourth Ecumenical Council held in Turkey in 451, where Christian leaders condemned Monophysitism. 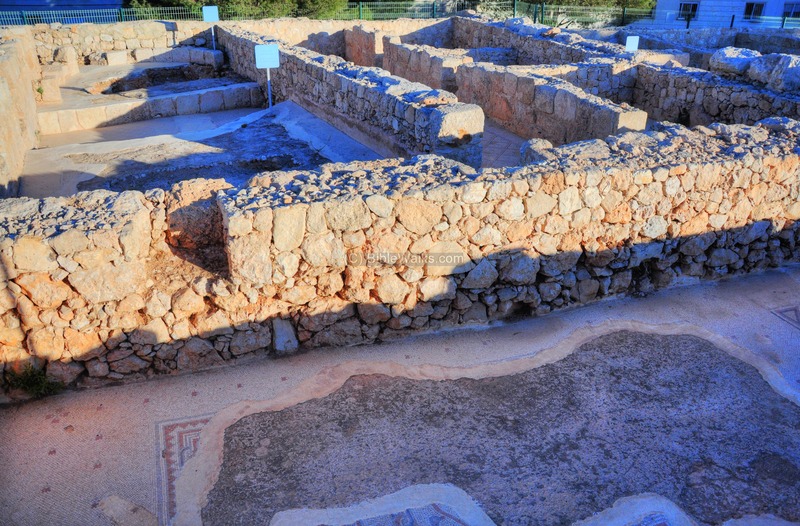 Martyrius and Elias first lived in the cells of the Laura of Euthymius. 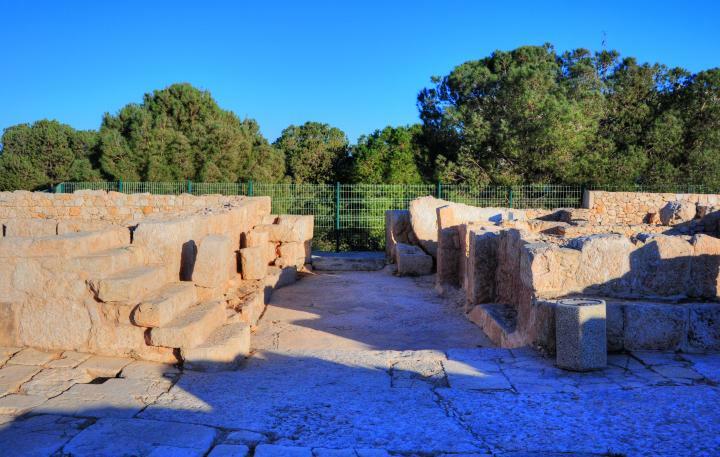 Euthymius "the Great" was one of the prominent fathers of the Judean Desert Monasticism, and a "pro-Chalcedonian" himself. 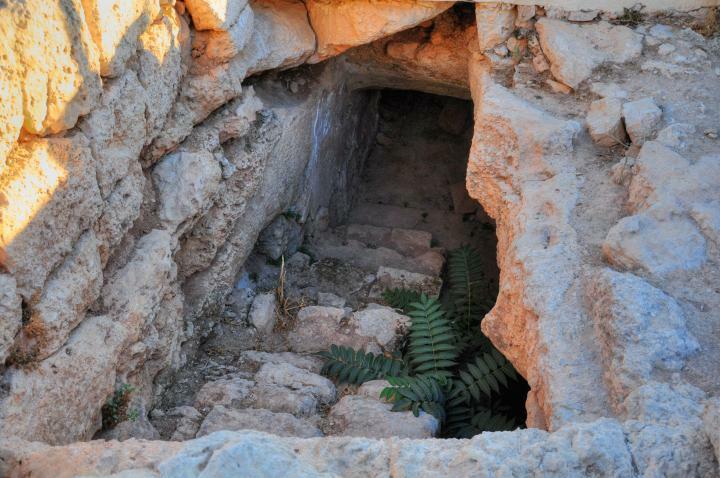 Feeling that the Laura is too crowded and the cells were narrow and uncomfortable, he moved to seclude in a cave 3km west of the Laura (on the location of the present monastery). 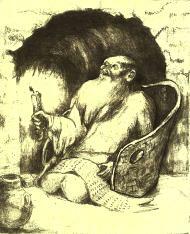 Later, he establishes a small monastery there with a small church around his cave. Martyrius then served as a priest in the Church of Holy Sepulcher in Jerusalem. In 478 he was appointed to the distinguished position of the Patriarch of Jerusalem, a title he held until his death in 486. This position was earned due to his fame and his consistent support of the coenobium system. He uses his power in this position to build a grand monastery by 482, which became a major center of monasticism in the Judean desert. The monastery hosted dozens of monks, and was one of the great centers of the Judean desert monasticism at that time. Due to its popularity, the monastery was renovated by Abbot Genesius the end of the 6th century (553-568AD). 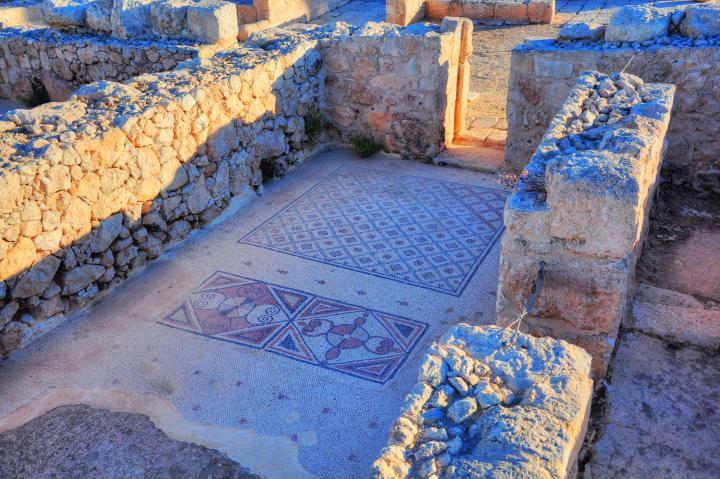 He repaved the mosaic floors of the church, constructed the grand refectory, and constructed the structures of the inn. At the end of the Byzantine period, the monastery suffered a series of blows: starting with a severe earthquake, followed by the Persian invasion (614), and finally abandoned during the Early Arab occupation in the 7th C.
"Khirbet el Murussus - A ruined monastery with a chapel, the foundations only remaining. The building has a total measure of 270 feet east and west on a line 86° west. The width north and south is about 90 feet. The chapel to the east has three apses. The nave 1 8- feet 3 inches diameter, the aisles 1 5 feet 6 inches. The length inside from the back of the apse is 64 feet. The northern aisle is almost entirely destroyed. 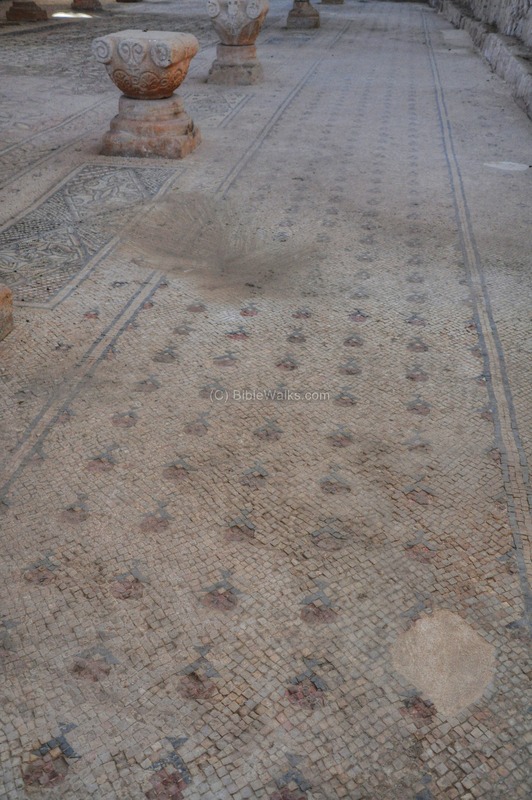 Remains of tessellated pavement occur on the floor of the southern aisle. The chapel has an atrium on the west and narrow cloisters on the north and south. In the latter is a well. A tower of later date has been built in the south-west corner of the building, and to the south of this are remains of the cobble-pavement (whence the place is named), in a courtyard the eastern wall of which is visible. 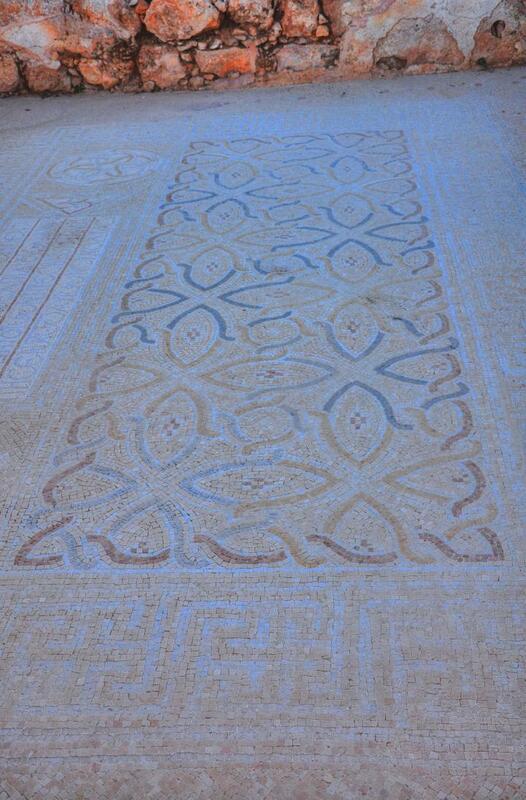 The tessellated pavement of the chapel has a simple pattern, red, white, blue and black. 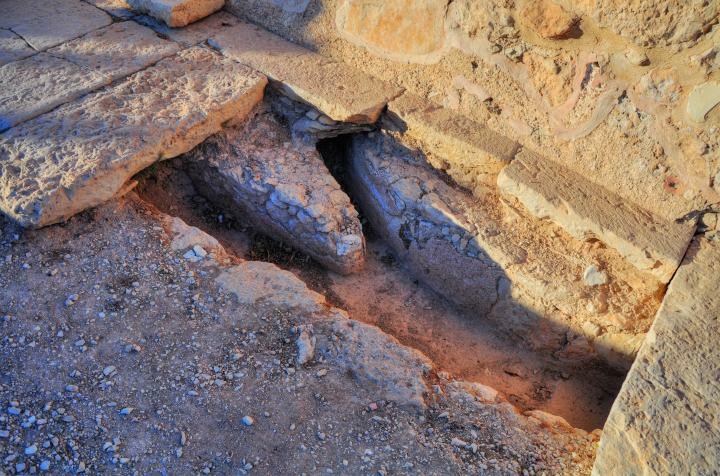 West of the building there is a cistern mouth with an octagonal cover, 6 feet 4 inches diameter, or 2 feet side. The Maltese cross is cut on each side of this octagon. The cover may perhaps have been originally a font removed from its proper place. The cistern beneath is of considerable extent, and has to the north another entrance, with steps leading down. 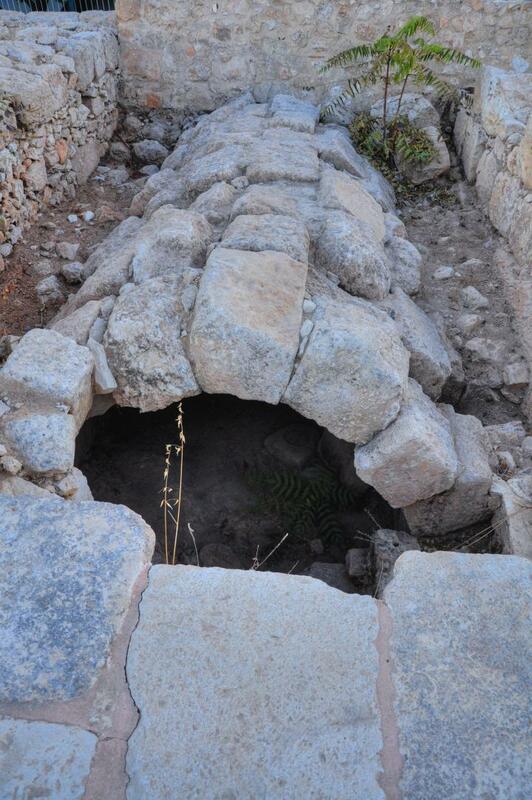 A water-channel runs some 10 yards southwest to a small reservoir, about 10 feet square, which was fed from the larger cistern. One of the stones in the building was measured and found to be 3 feet inch long, 1 foot 5 inches high, 2 feet 2 inches thick. 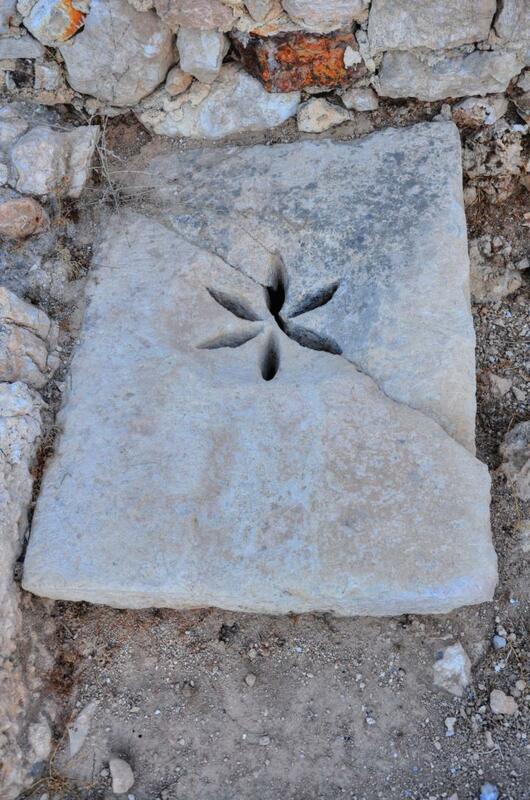 The stones in the tower are older material used up ; one had a cross, in a lozenge and square, cut on it. The ruin stands on a hill 500 feet above the valleys, and there are traces of a considerable site and other cisterns of good size. 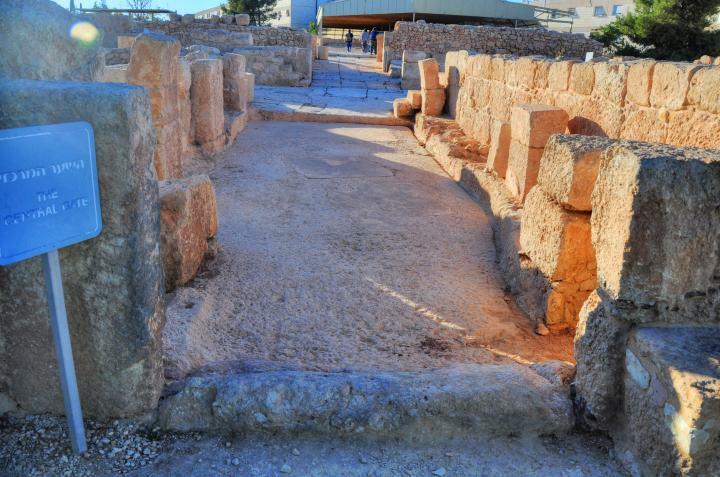 Between the ruin and Khirbet ed-Dikki there is a rude erection which looks almost like a dolmen. 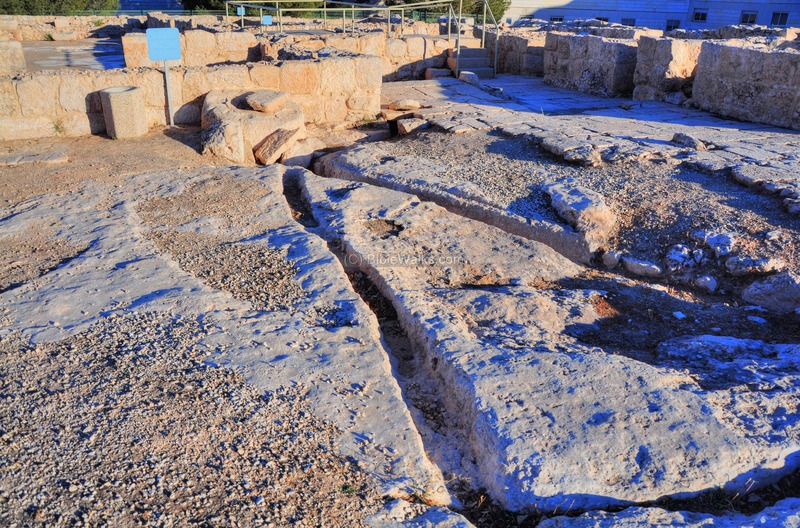 Two slabs rest on others, and below there is a small semicircular platform of unhewn stones, and lower down a small natural cave". 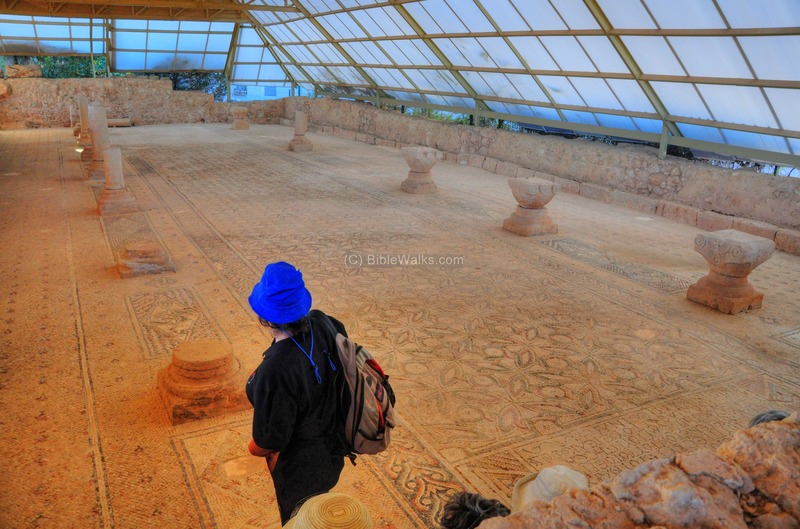 The monastery was excavated in the 1980s, under the direction of Izhak Magen of the Israeli Antiquities Authority. It was opened recently, but with limited visiting hours. The monastery plan is almost square, and its 10 Dunam (2.5 acres) area was protected by 2m (6ft) high walls. The main gate is located on its east wall. An inn (hostel) is built on the north-east area outside the walled complex. A color-coded plan of the monastery is shown below. The Inn is located on the north-east side of the monastery (on the top right - marked by orange color). The main entrance to the complex is from the west gate, which opens to the main corridor. The corridor leads to the center of the complex, and opens up to the central courtyard (grey). On the south side of the corridor is the church (yellow). A stable and pen are located to the north of the corridor (purple). The Refectory and kitchen are on the north-west corner (green), and a bathhouse is on the west side (blue). On the south wind are the monks' rooms (pink) and the south-east chapel (grey). You can press on any of the titles on the plan in order to jump to that section. A drone captured this view, at the same direction (northwards) of the plan illustrated above. The refectory and kitchen, on the north west corner, are covered by a roof. 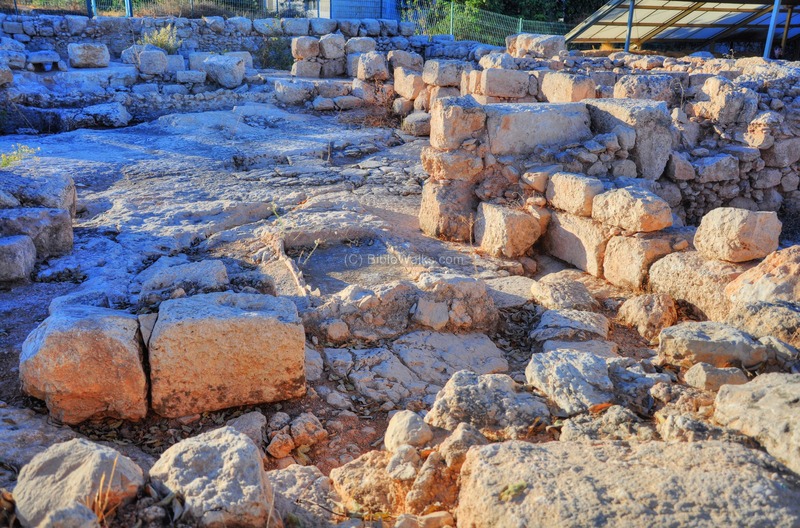 All around the ruins are residential buildings of Ma'ale Adummim. On the north-east side of the monastery are structures which served as an inn (hostel). This area, 20m by 43 m, is marked as a red square on the plan on the right. 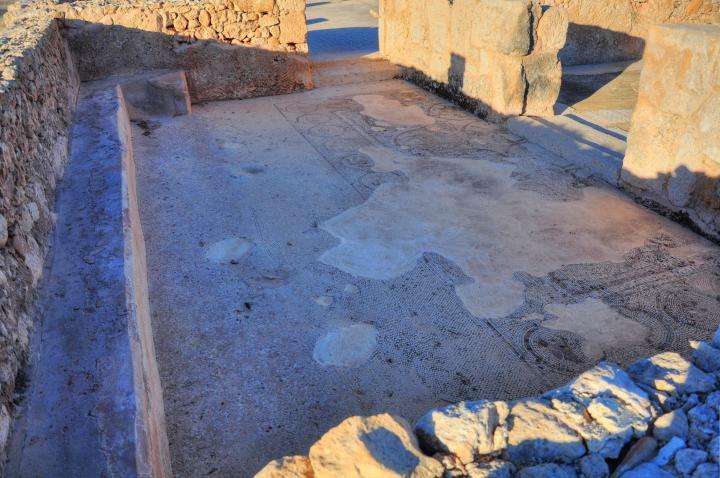 It contained guestrooms, stables, and a chapel. 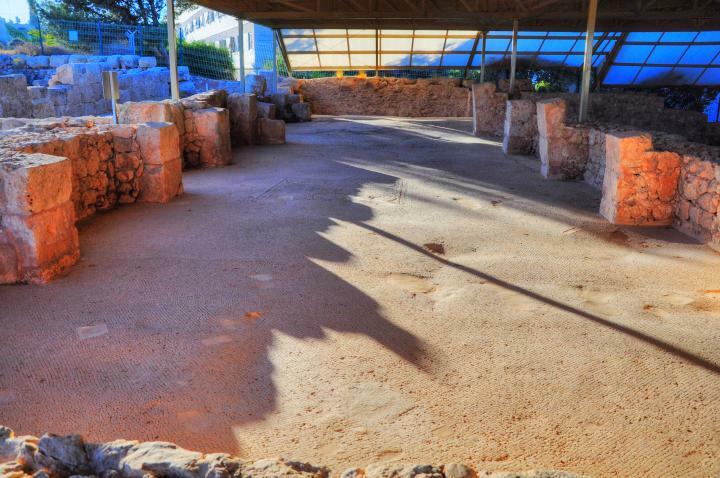 The inn serviced the visitors of the monastery, as well as the pilgrims and travelers of the Jordan-Jerusalem road. 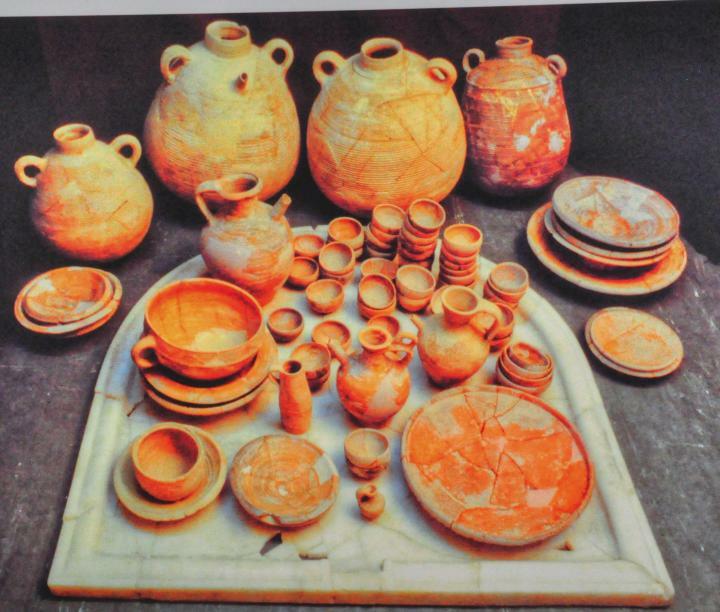 This was one of the main sources of income for the monastery, in addition to donations and funding by different organizations. A north view of the stables is shown in the following picture. 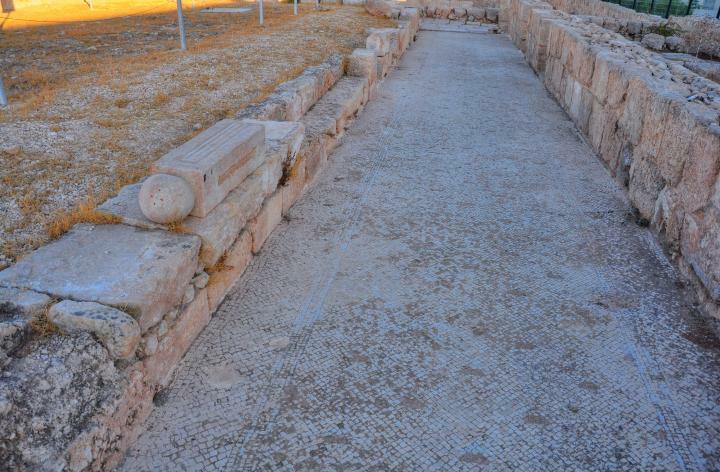 The long feeding trough is located on the left side of the paved floor. A south-east view of the stables is in the next picture. Behind it are bedrooms and a chapel which serviced the visitors to the monastery. The inn was constructed by the Abbot Genesius at the end of the 6th C.
The central gate is located on the east side of the monastery, as marked with a red square on the plan on the right. Additional smaller secondary entrances are located on the south-east side, facing the south corridor, and on the south side entering the monks' quarters. They are marked with smaller purple squares. The main gate was based on wooden doors, supported by iron door hinges on the sides of the opening. A triple set of arches are located behind the main gate, along the corridor that leads to the central courtyard. The remains of the bases of the arches, as well as the walls along the sides of the corridor, can be viewed in the picture below. The room on the left served the gate keeper. 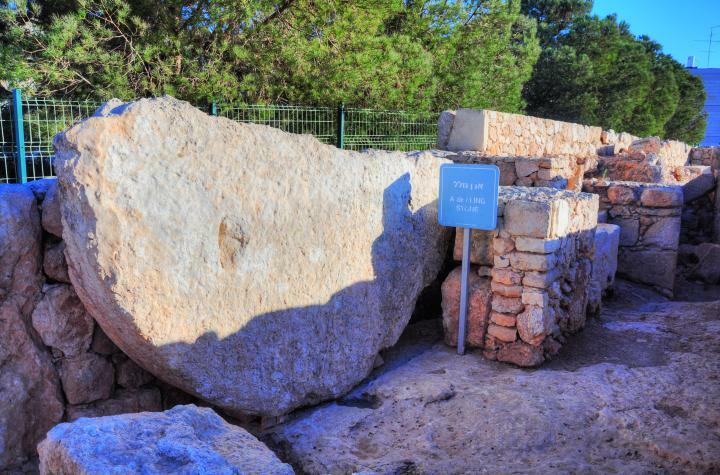 A heavy rolling stone, 2.5m in diameter, was used to add protection behind the wooden doors. On the south side of the main gate is the large church. It is marked with a red square on the plan on the right. The size of the church is 6.6m (22ft) x 25.5m (84ft), and its apse is on the east as nearly all churches. As seen in the picture below, the floor was covered by colorful mosaics, although only small fragments of the floor survived. The patterns depicted in the mosaic floor include animals and birds within round and hexagon frames. A section of these is shown in the next picture. A Greek inscription was found on the floor, which names of two abbots (Genesius and Iohannes). Abbot Genesius was the head of the monastery during the renovations of the monastery at the end of the 6th century (553-568AD), when the mosaic floor was repaved. The atrium of the church is located on the west side. 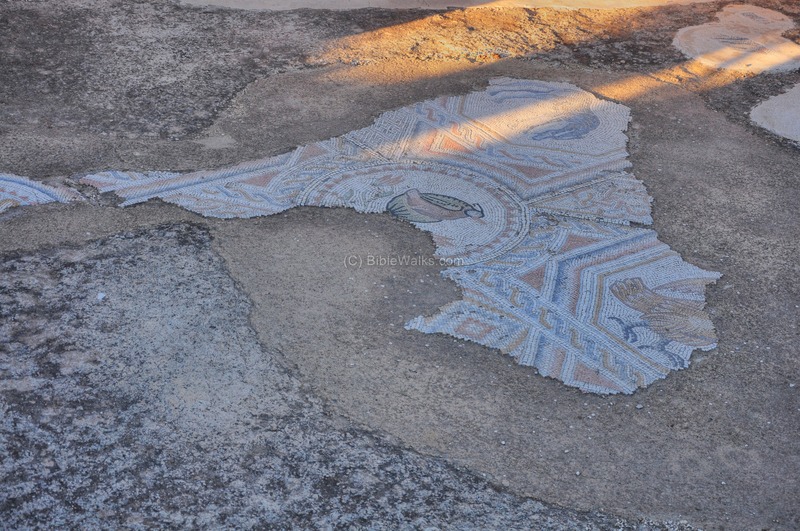 It was also paved with the same mosaic design. 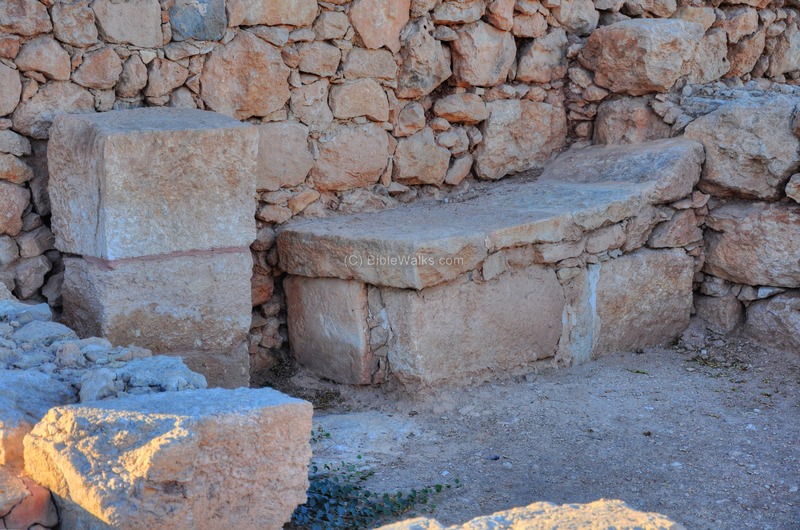 A stone bench is located on the western wall. On the south side of the main apse is a smaller apse, which is indicated by a red square on the plan. This apse is seen on the edge of the left side of the picture below. Additional hall and three rooms are seen on its southern (right) side. A large (45m x 60m) courtyard is located in the center of the compound. This area is marked as a red square on the plan on the right. A view of the north side of the courtyard is shown in the picture below. Only small sections of the stone pavement has survived. Another north view of the courtyard is in the next picture. The refectory hall (dining room) is located on the north-west corner, and the kitchen is in the adjacent hall. The area is covered by a modern roof in order to protect the mosaic floor. This area is marked as a red square on the plan on the right. 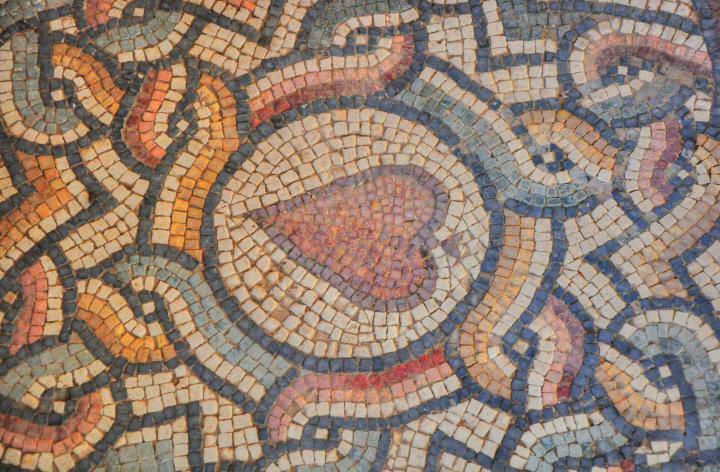 The refectory is a large (25m x 31m) hall, with a beautifully preserved mosaic floor. It is surrounded by stone-built benches, where the monks sat during the meals. 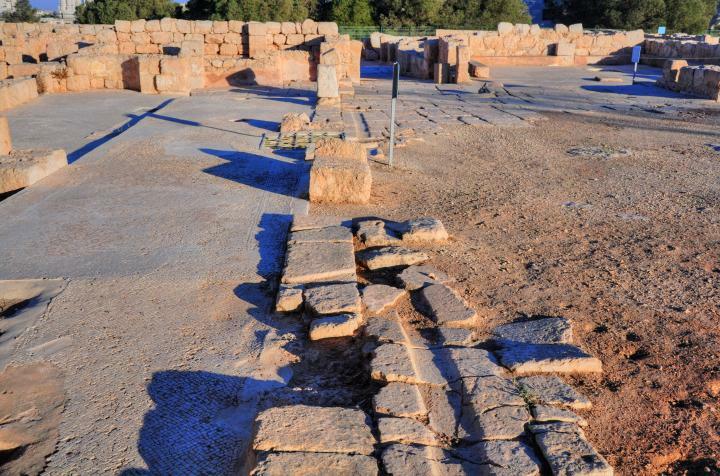 Two rows of columns, whose bases are seen along the floor, supported its second floor. 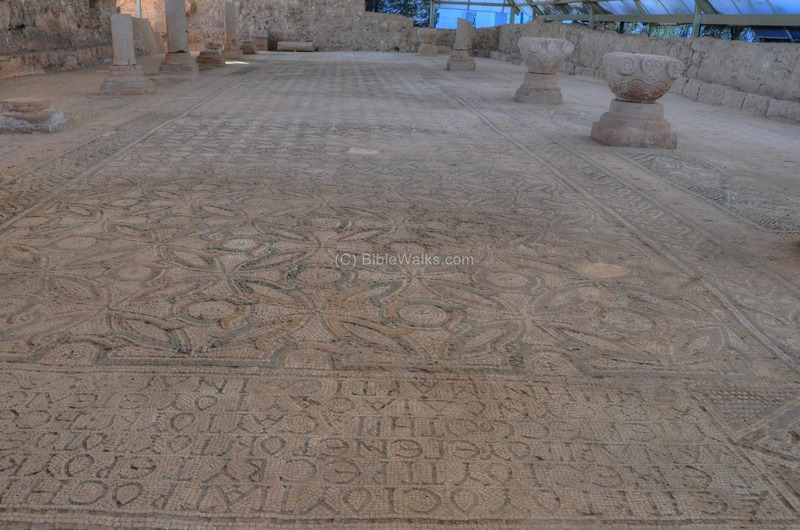 The Greek inscription on the eastern side tells about the construction of the refectory by Abbot Genesius during the end of the 6th century ((553-568AD). It reads: "During the time of our holy father Genesius, presbyter and archimandrite, this work too was done for his salvation and for the salvation of his brethren in Christ. This work was completed in the month of March, in the first year of the induction." The next picture shows a detail of two of the columns, their capitals, the mosaic floor and the stone benches where the monks sate to eat. A large (21m x 6m) kitchen is located along the south side of the refectory. 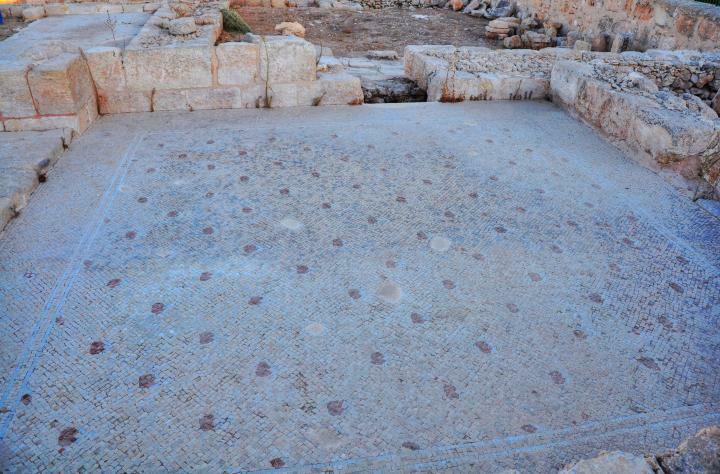 It is also paved with mosaics, and contained marble tables. On the north side of the monastery is a large burial cave, which contains the tombs of several important important leaders of the monastery. This was probably the hermitage cave used by Martyrius before the monastery was constructed. The entrance to the cave is near the refectory, with a flight of steps leading down to the burial cave. 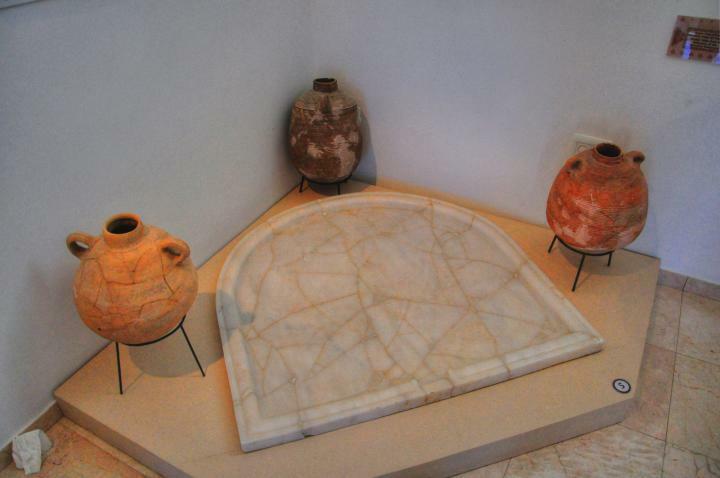 Another burial place inside the Monastery's complex is located in a room near the church, on the side of the main corridor. This is the Abbot's burial hall, which is shown in the picture below. 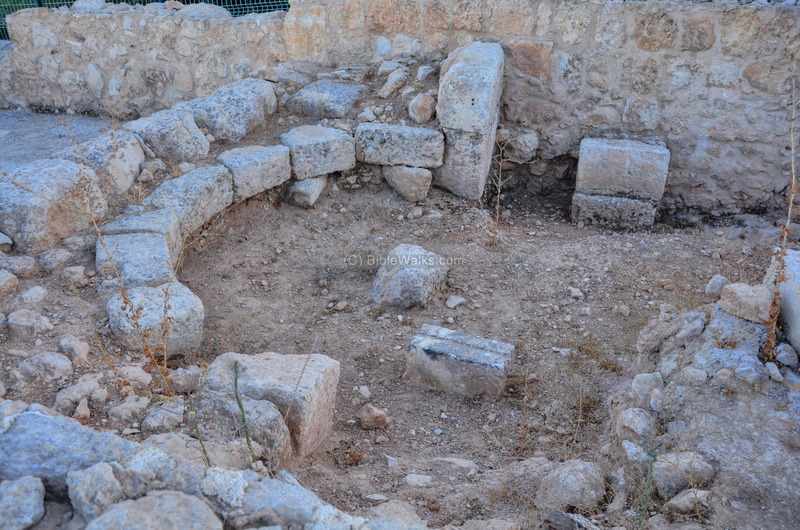 This was the tomb of Paul (Paulus), the Abbot of the Monastery, who headed the construction of the monastery during the period Martyrius served as Patriarch of Jerusalem (478-486). 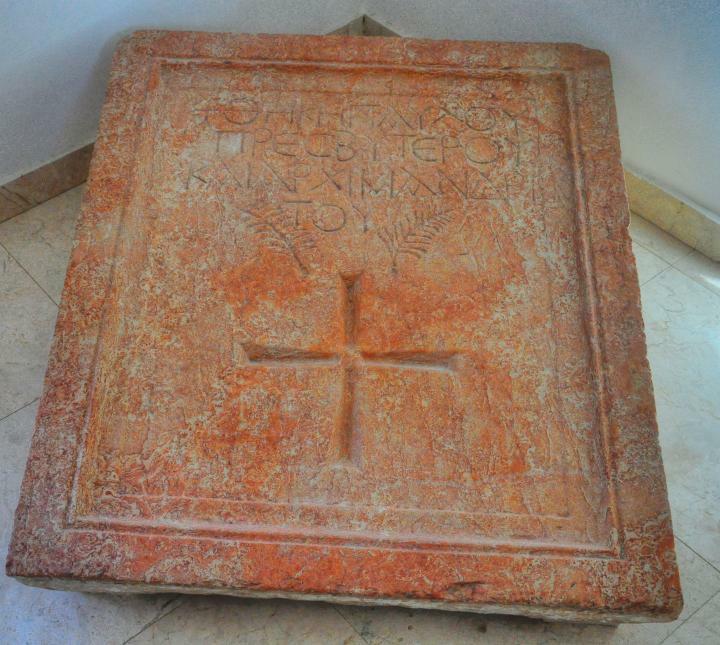 Paul's tombstone is on display at the museum of the Good Samaritan. 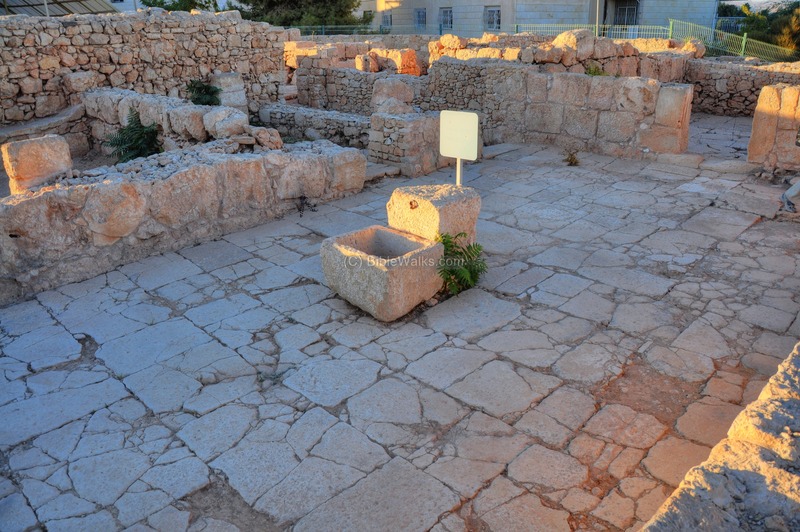 On the west side of the monastery is a bathhouse. It stood above a heated raised floor which stood above ceramic columns. A view of the bathhouse, and the rooms around it, is shown in the picture below. On the south side of the monastery are the rooms of the monks, and a chapel. This area is marked as a red square on the plan on the right. The chapel is located in the center of the residential quarter, near the south-west corner. Its apse, oriented to the east, is shown below. One of the rooms located along the southern wall is shown in the next picture. 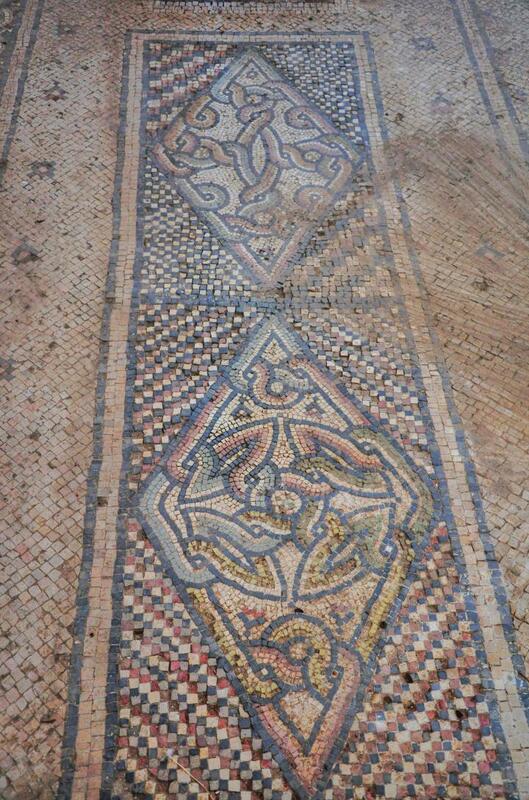 On the south east side of the monastery is a chapel with a beautiful mosaic floor. It is marked as a red square on the plan on the right. The chapel was constructed in the end of the 6th century by Genesius. 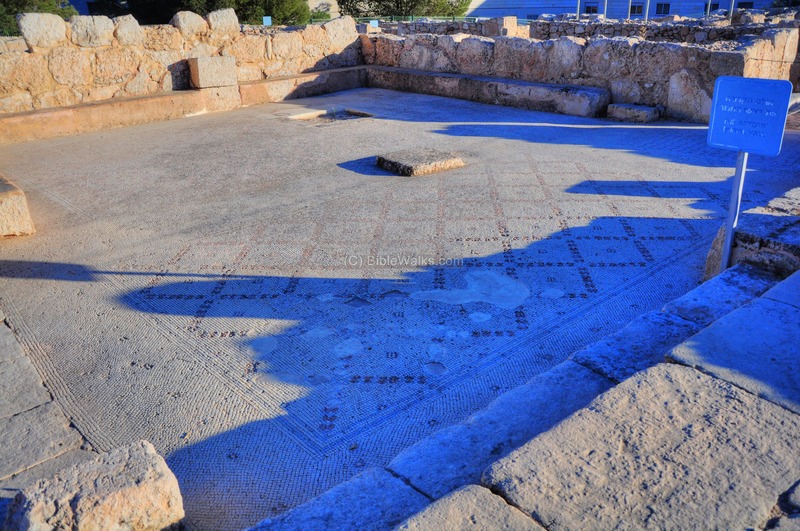 It is called "the chapel of the three Priests", based on the Greek inscription found on the mosaic floor. The altar is on the east side of the chapel - the left side of the picture below. 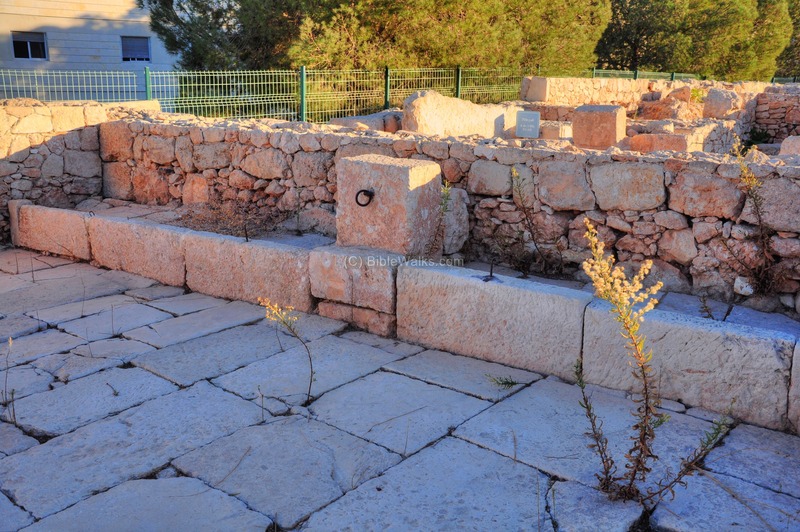 Where did the monastery gets its water supply? The dry area of the Judean desert presented a great engineering challenge for the constructors of this large monastery, which was located on a high hill with no springs in the area that could be diverted with an aqueduct. The solution was to store the scarce rain water into large underground water reservoirs. 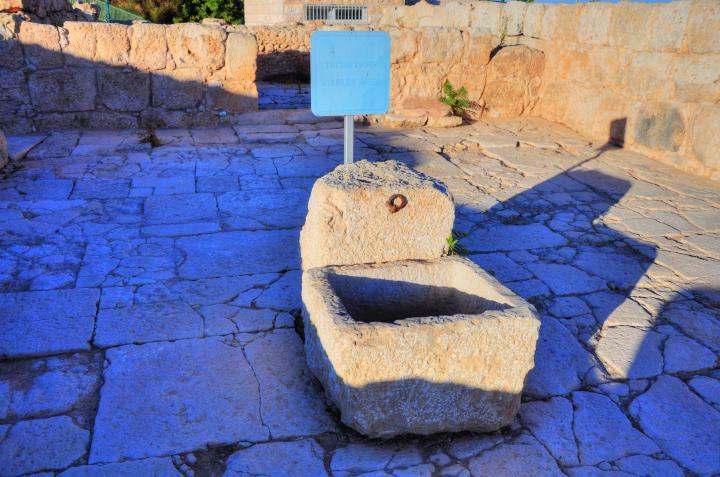 These reservoirs were the only source of water supply for the monastery. 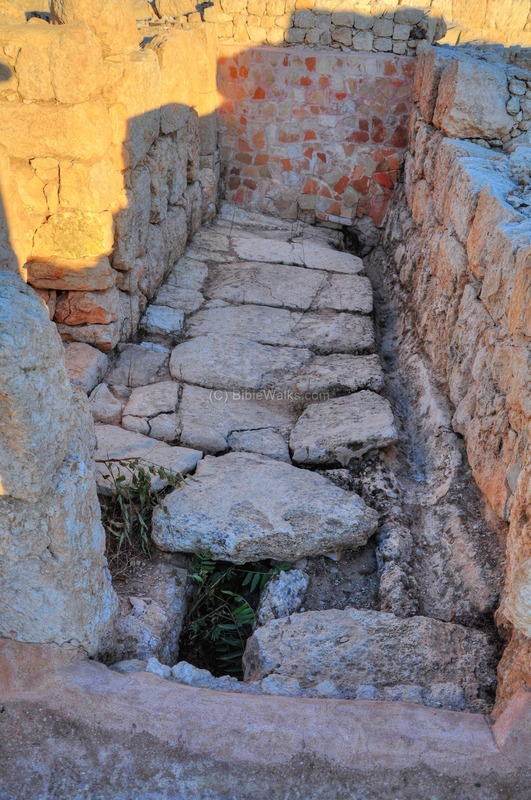 Several gutter channels crossed under the paved floor of the courtyard in order to collect the rain water into the cisterns. On the north-east side of the monastery are the stable and pen. This area is marked as a red square on the plan on the right. The paved stable - seen below - has hooks to harness the horses, and troughs to feed them. 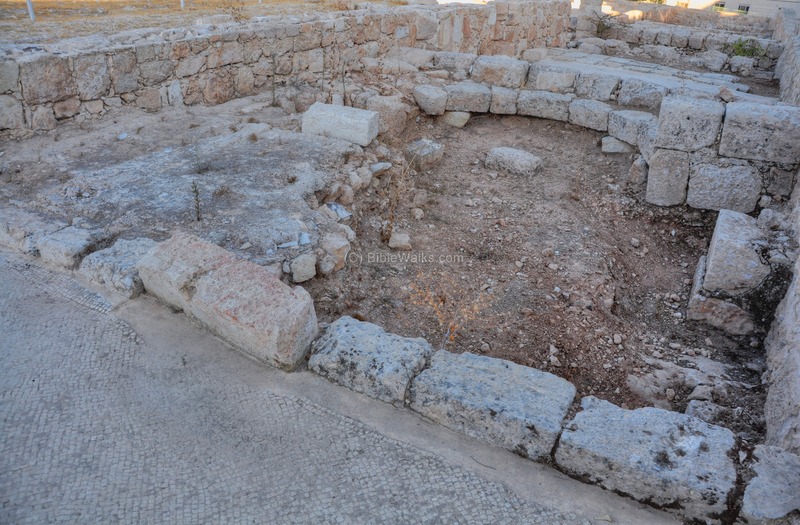 A water basin is located in the center of stable. Bottom line - a unique site to visit and learn about the Judean desert monasticism. 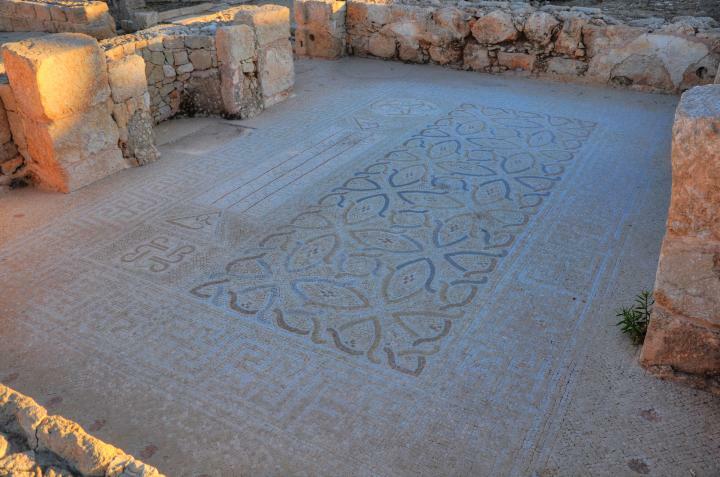 Khirbet el-Murassas - Arabic name of the monastery (Murassas: "covered with lead or tin; glazed; compact"). According to the PEF survey, this name means "cobblestone-paved", since this is how the ruins appeared in the Ottoman period. Martyrius - Latin, means: I witness. 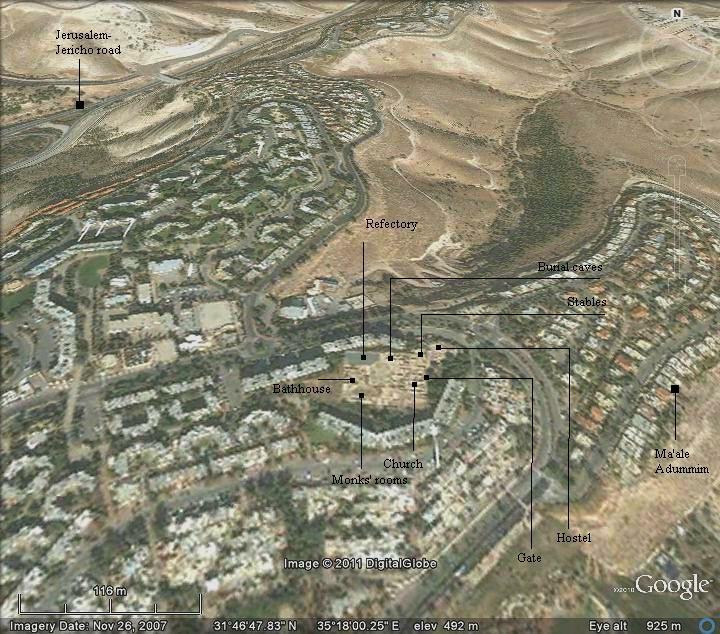 Ma'ale Adummim - Hebrew: Red Ascent or Red Heights. This is the area above Nebi Musa, named after the red hills. In Biblical times it was a landmark the north-east border of Judah (Joshua 15 7): "before the going up to Adummim...". 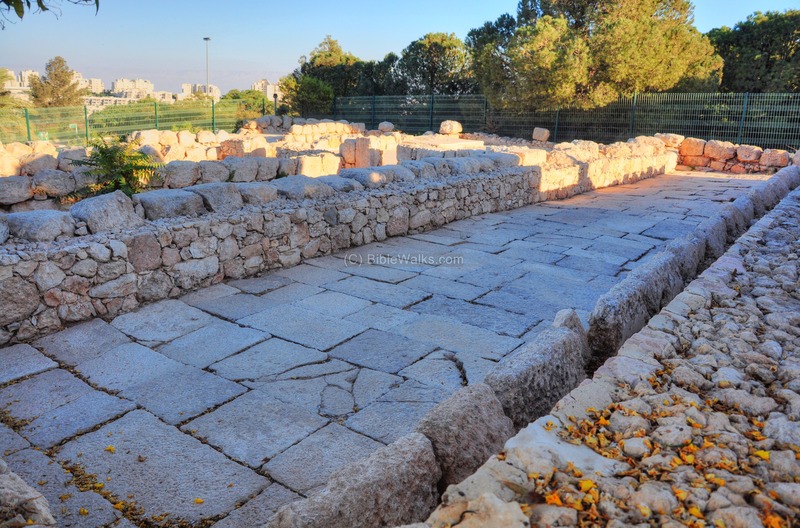 Ma'ale Adummim is also the name of the city on the eastern suburbs of Jerusalem, which was established in 1991, and named after the Biblical place.